Srinagar, April 18 – Chief Secretary Mr. S. S. Kapur today said the government is following a systemic approach for the promotion of tourism in the State. He said the approach has yielded results and trade enquiries are coming from a number of areas. In an informal chat with the electronic media, here today, the Chief Secretary said though due to elections in the country, the tourist arrivals have been slightly lower than the previous year, the last few days have shown increased arrivals. He said a high-level official team headed by Secretary Tourism is going to Jaipur to attend an interactive meet for boosting tourism in the State. On the improvement of Dal Lake, Mr. Kapur said the project will receive attention from the State government and would welcome positive and constructive suggestions from people including media. He urged the media persons to report things correctly and in proper context. He said the Dal Lake and houseboats are interconnected and hoped soon the houseboats would put in place necessary sanitation mechanisms. He said in this regard, 3 or 4 sanitation mechanisms have already been tested. The Chief Secretary said in the long term, Kashmir rail, four-lanning of the National Highway and Mughal Road are the projects which can provide critical infrastructure base for the tourism industry in future. Stating that State government has pursued early-completion of Qazigund-Udhampur rail link with the Centre, Mr. Kapur said the government has also requested the Centre to consider the Mughal Road project on cent percent funding on the pattern of Prime Minister’s Reconstruction Plan projects. He said the road is already trafficable for light-motor vehicles. 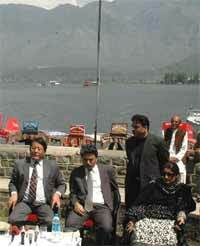 Mr. Kapur said in the Srinagar city, a number of roads with tourist importance are being given a decent look. He said the High Court recently passed an order making throwing of solid waste a punishable act and said culprits would be dealt with accordingly. He said the government is very serious about banning polythene for which law needs to be translated into action.